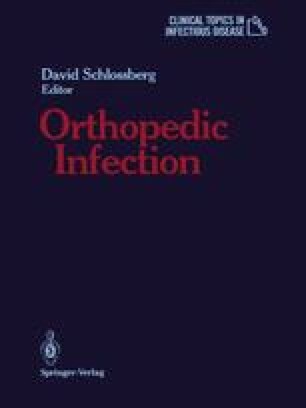 There is no generally accepted definition for chronic osteomyelitis, a term that has been employed to describe bone infections based on temporal, histologic, or etiologic factors. Waldvogel et al. (76) considered, for epidemiologic purposes, only those patients with a prior admission for the same infection. This narrow definition identifies one group of patients with chronic osteomyelitis, but tends to exclude patients with the initial onset of indolent bone infection as well as many patients with osteomyelitis complicating foreign bodies, including orthopedic appliances. Other authors have used histologic criteria to separate acute from chronic osteomyelitis (5), and many of the experimental models have used this approach as well.